I saw plenty of cows today, including in a children’s book called “Hide and Sheep” with, you guessed it, lots of sheep. And of course some cows and pigs. 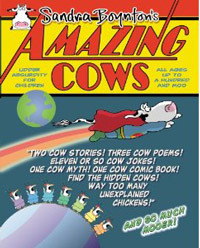 For today’s featured cow sighting, I’ll have to blame myself. Well, technically it was myself from a couple of years ago. Huh? I now hear you say. Is she a time traveler? Sorry, I didn’t mean to confuse you so here’s the short explanation. I’m a bargain shopper and having two boys requires a lot of clothing. So several times a year I shop the clearance racks at a number of stores and buy clothes in the next two or three larger sizes my kids will need. This way I can usually stock up on clothes for at least half the price and not worry about having to buy them at full price when I need them. Follow me? Let’s go back to last night, when I picked out clothes for my kids to wear this Friday. For my oldest I chose light kakhi pants and I went through his pile of T-shirts for a nice match. At the very bottom of the short-sleeve T-shirt pile, I found a brown colored shirt I thought would work great. 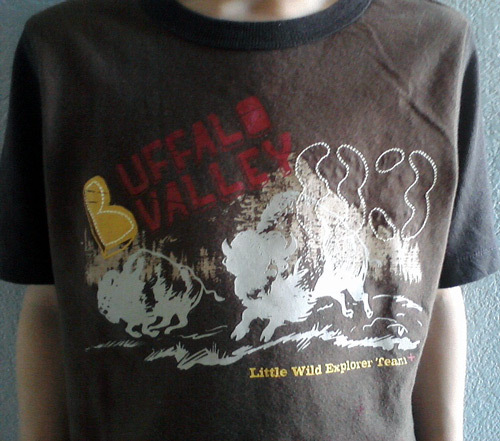 This morning my son put the shirt on and I realized it was covered with… buffalo! How funny is that? I bought that shirt a couple of years ago and my son never wore it until this morning. I had no idea these bovines were lurking in our drawers all this time. This can only prove one thing: the daily cow theory was true a few years ago and it holds true today. 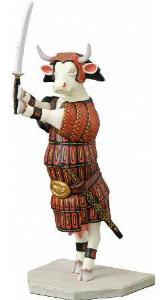 Have you seen a cow today? Next Post Got keys? How about this cow keychain?